General Characteristics: Medium in height, well spreading, maturing within 8 to 12 months, producing from 5 to 10 oha; characterized by light purplish-black petioles shading into yellowish-green at apex and light lilac-purple corm flesh. Petiole: 60 to 85 cm. long, drooping, light purplish-black on lower part shading into yellowish-green at apex, with an inconspicuous, narrow reddish edge, a dark reddish-purple ring at base with dark lilac-purple for 3 to 4 cm. above. Leaf blade: 35 to 45 cm. long, 25 to 35 cm. wide, 25 to 35 cm. from tip to base of sinus, sagittate, medium green; margins undulate; piko light brownish; lobes acute with medium-cut sinus. Corm: Flesh light lilac-purple; skin light reddish-purple. 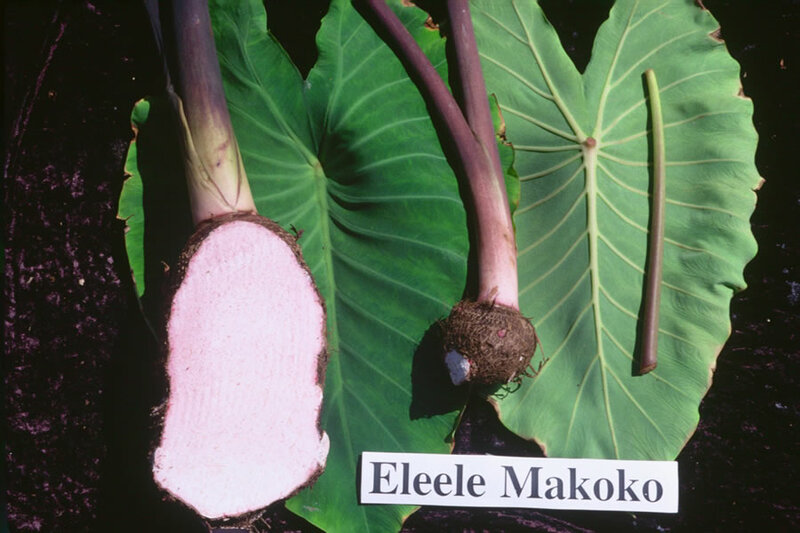 Inflorescence: Peduncle blackish; spathe 22 to 25 cm. long, the lower tubular portion 3.5 to 4.5 cm. long, yellowish-green tinged with brown, with purplish areas at base and at constriction, the upper portion yellowish, slightly open at maturity; spadix 7 to 9 cm. long, the sterile appendage 6 to 7 mm. long. Origin, and derivation of name: Native variety; makoko is a reddish fish. Distribution: Not planted as widely as Eleele Naioea but its distribution is quite general; chiefly under upland culture. Use: Makes light red poi of good quality; although not important commercially, it is grown fairly extensively for home use.